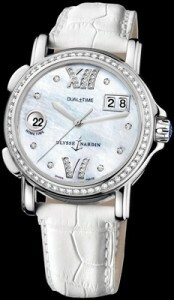 This is the Ulysse Nardin, Lady Dual Time GMT. It is a stainless steel case, with a 42 hour, power reserve, automatic movement. This timepiece displays two different time zones, and date on the dial at all times. The Mother of Pearl dial is set with diamonds, and it looks stunning, it is the perfect companion for traveling from coast to coast, or for traveling the world. It is available on white crocodile leather, with a stainless steel, folding buckle.